From time to time we’ll post photos of Guernsey Cow memorabilia. And from time to time we’ll post a link to memorabilia currently for sale on eBay by various collectors and antiquers out there. See the postcard below being sold by someone in Shrewsbury, PA. I’ve bought several of these over the years on eBay. Click the image to see the eBay listing. In the early 1970’s before any of my siblings and I were ready to start working at the Cow we had the pleasure of dining there every Tuesday night with our grandparents. My recollection is that this was a summertime tradition. One of the benefits of being grandchildren of the proprietors was that we were allowed to order or help prepare whatever concoction we wished for dessert. Our best efforts were put into pulling together the greatest variety of flavors and toppings. Once we wolfed that down, we usually ended up playing tag until nightfall out on the expansive property of the Cow and the adjacent Sleepy Hollow Hall where our mother grew up. Occasionally, the combination of the limitless ice cream bar and running around on a summer evening led to more than a few upset stomachs. However bad it got, by the next Tuesday the competition was on again for packing flavor in. 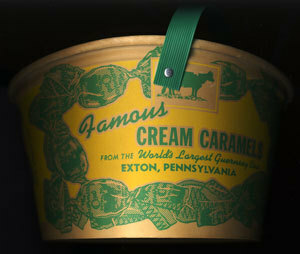 Stop by the Flavors page to recall and post your favorite Guernsey Cow ice cream flavors.